Sales Estimators work mainly for the sales and customer service arena, to improve process and procedures as a means to improve business models. Even though these professionals are hired by different type of companies, the job description remains the same and includes the following – forecasting cost estimates for new project, studying and analyzing prevailing economic condition that affects the company’s selling ability, estimating job costs, negotiating cost, analyzing vendor pricing, analyzing blueprints, cost monitoring, preparing cost and expenditure statements, and assessing cost-effectiveness. 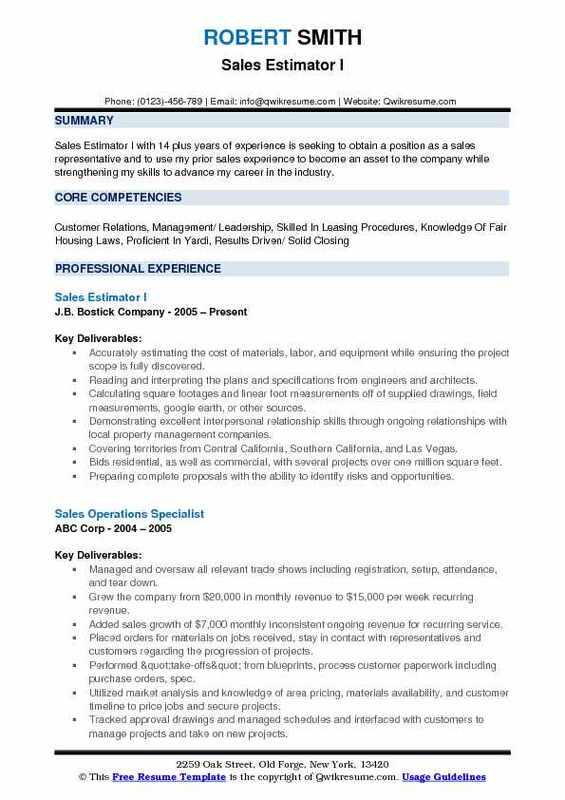 Objective : Skilled Sales Estimator with versatile experience of 4 plus years in planning and managing multimillion dollar projects. Capable of aligning business goals with solutions to drive process improvements and competitive advantage. Known for the ability to produce high-quality deliverables that meet or exceed timelines and budgetary targets. Expertise in contract analysis, negotiation, and development resulting in exceptional client satisfaction and bottom-line gains. Developing financial estimates, preparing proposals, and performing the necessary follow up for successful sales closings. Utilizing various criteria including historical data, industry standard specifications, engineering drawings, part. Characteristics and quantities, and other data to ensure the accuracy of estimates. Computing the job costs by analyzing time, labor, material, and equipment requirements. Ensuring estimates satisfy engineering, process control, and quality requirements. Troubleshooting deviations and consult on solutions. Performing approval and process validation to ensure the organization has applicable capabilities in order to carry out services. Planning and sequencing the processes to determine appropriate turnaround and delivery estimates. Qualifying and estimating the cost of non-stocked, custom materials. Coordinating post-production cost analysis on key parts and programs to continuously improve the effectiveness of historical data. 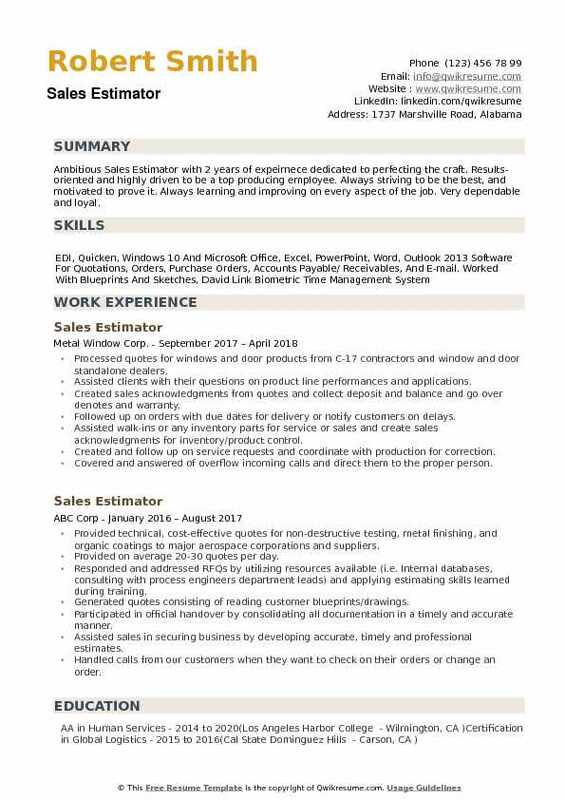 Summary : Sales Estimator I with 14 plus years of experience is seeking to obtain a position as a sales representative and to use my prior sales experience to become an asset to the company while strengthening my skills to advance my career in the industry. Accurately estimating the cost of materials, labor, and equipment while ensuring the project scope is fully discovered. Reading and interpreting the plans and specifications from engineers and architects. Calculating square footages and linear foot measurements off of supplied drawings, field measurements, google earth, or other sources. Demonstrating excellent interpersonal relationship skills through ongoing relationships with local property management companies. Covering territories from Central California, Southern California, and Las Vegas. Bids residential, as well as commercial, with several projects over one million square feet. Preparing complete proposals with the ability to identify risks and opportunities. Managing and maintaining estimate calculations including accurate information on prices from subcontractors and suppliers. Effectively communicating with production until project completion to ensure desired results. 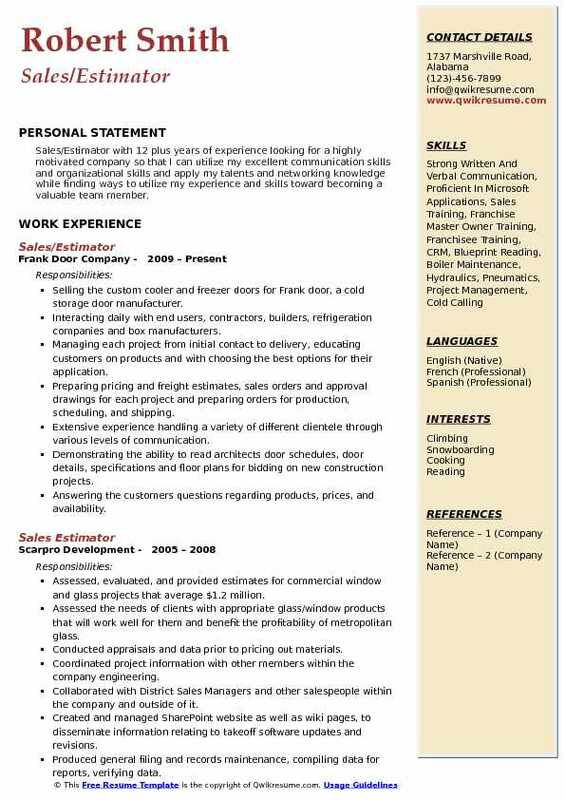 Objective : Sales Estimator with 5 plus years of experience in the Construction domain is seeking a Management, Sales, Design, Project Management, Estimating or related position where I will utilize my extensive experience combined with my management skills to effectively generate and oversee the increased business. Met with 190+ clients interested in renovations on their home/business. Leading the selection process for materials and colors to be utilized in the renovation process. Instructing the job site personnel to ensure the completion of projects as designed. Created over 190 proposals to clients and insurance companies for projects with "Quickbooks", "Exactimate", and "Microsoft Office" software. Negotiating with insurance adjusters to get the highest level of coverage for the client. Completing all paperwork required to ensure payment on final invoicing for projects under my direction. Working within company mandated guidelines for profit and overhead coverage. Achieved the highest level of customer satisfaction on all projects under my direction. Achieved sales of 1.1 million on average per year. Met new and previous clients to create designs and solutions for renovations and remodeling needs. Completed 12-15 projects per year with an average of $89,000. Summary : Sales Estimator with 12 plus years of experience in the Manufacturing domain is seeking a permanent job where all abilities can be used daily to help a company prosper and grow. Receiving drawings and specifications on projects from the customer to provide them with a lump sum or unit prices on projects. Providing the pricing of material, estimating labor to fabricate and coat material, and shipments of material. Responsible for writing and submitting a proposal letter defining qualities terms and conditions as well as listing any information pertinent to the project. Obtaining the best pricing from vendors through constant communication, maintaining good relationships, and negotiation. Using Steel 2000 and Fab Suite estimating programs to price projects ranging in price from $10,000 to $147,000,000. Estimating between one and three jobs a week depending on the size of the project. Communicating with the project management once a job has been sold and answer any questions that could arise during the project relating to estimating and/or pricing. On-site representative during the construction of a $1,900,000 stamping addition, at Honda of Alabama, in Lincoln, Alabama. Assisted the erection company including the scheduling of steel deliveries, problem solve and report to Honda each day on project progress. 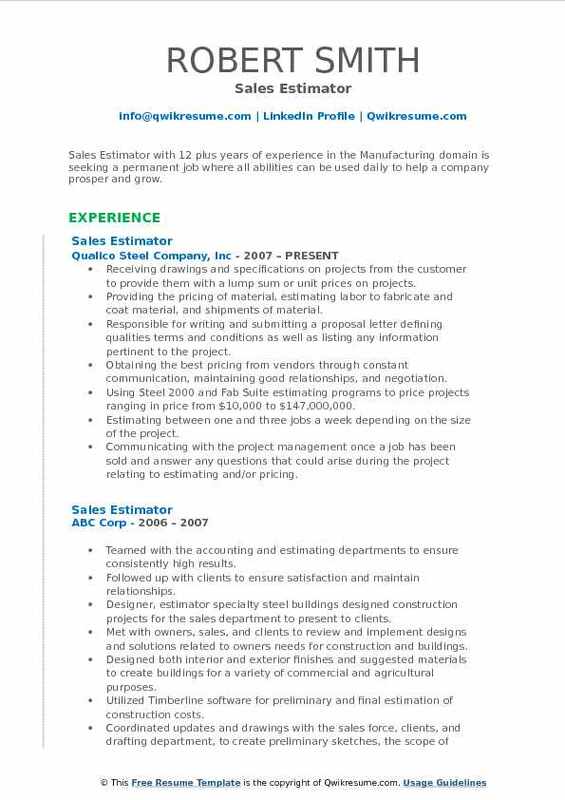 Summary : Sales Estimator II with 15 plus years of experience is seeking to work with others to grow sales, increase repeat customers and meet the needs of existing customers. Doing take-offs from prints/specs for HVAC and electrical for, retrofit, and new construction for residential and commercial. Working with vendor and suppliers to develop and maintain a current sales price book and sales material files to present to customers. Researching and finding leads through newspapers and construction/trade postings. Measuring the house figure load on house, examine the duct system and return, check existing system to see if code improvements are necessary HVAC and electrical. Estimating job at customers home then presenting the customer with good/ better/best proposal. Taking the digital photos to help with material list and explanation to install crew. Placing a sign in yard and doorknockers on homes on both sides of customer and three houses across the street. Taking the install crew to the job and walk through on start date introduce to the customer. Working with the service department to take calls for change outs/retrofits by phone, estimate job and quote while there. Owned and operated general construction business residential and light commercial. 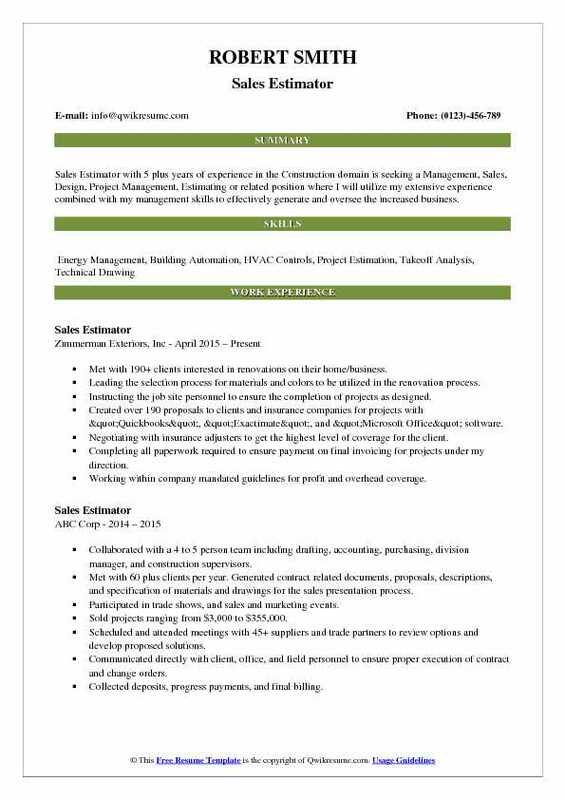 Summary : Senior Sales Estimator with 8 years of experience is seeking a secure and challenging position with career opportunities that will utilize my extensive abilities and experience in the business field. Developed and followed marketing plans and objectives to ensure annual growth results for Northern Michigan locations. Utilized appropriate interpersonal style and relationship building to facilitate an acceptance of an idea, plan, or product to help generate market share and deployment of home depot installation products and services. Continually assessed specialized and specific up to the date product release plans for assigned territory. Established A vast network of lateral community resources such as business networking international and other groups to fast-track marketing efforts. Recruited and worked with partner sales colleagues to assist in multiple marketing and branding campaigns beyond my territory. Routinely met with consumers in their homes to help them with their remodeling projects. Formulated an event vendor booth, set up and attended trade shows throughout Michigan and the country. Tracked all sales accounts contacts digitally using software such as Salesforce and QuickBooks. 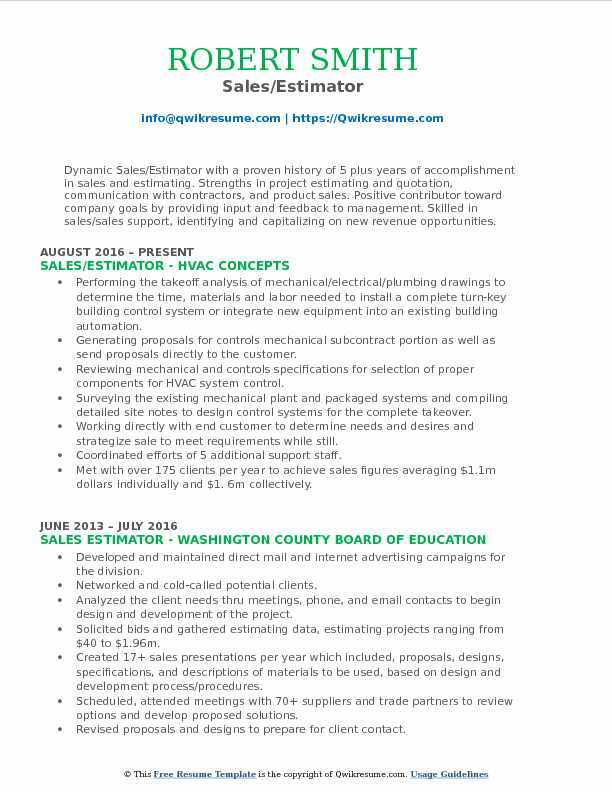 Headline : Dynamic Sales/Estimator with a proven history of 5 plus years of accomplishment in sales and estimating. Strengths in project estimating and quotation, communication with contractors, and product sales. Positive contributor toward company goals by providing input and feedback to management. 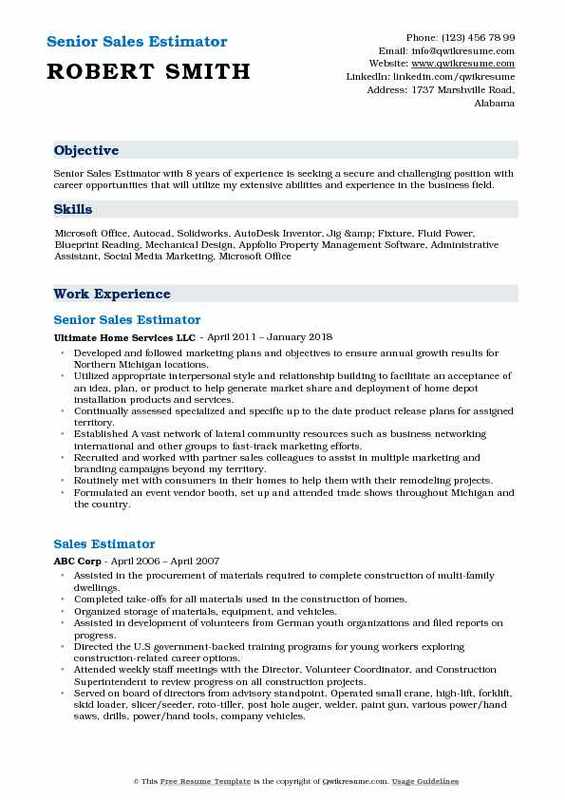 Skilled in sales/sales support, identifying and capitalizing on new revenue opportunities. Performing the takeoff analysis of mechanical/electrical/plumbing drawings to determine the time, materials and labor needed to install a complete turn-key building control system or integrate new equipment into an existing building automation. Generating proposals for controls mechanical subcontract portion as well as send proposals directly to the customer. Reviewing mechanical and controls specifications for selection of proper components for HVAC system control. Surveying the existing mechanical plant and packaged systems and compiling detailed site notes to design control systems for the complete takeover. Working directly with end customer to determine needs and desires and strategize sale to meet requirements while still. Coordinated efforts of 5 additional support staff. Met with over 175 clients per year to achieve sales figures averaging $1.1m dollars individually and $1. 6m collectively. Collected fees ranging from 3 to 5 percent of total project cost for design and development of projects, resulting in reduced overhead costs. 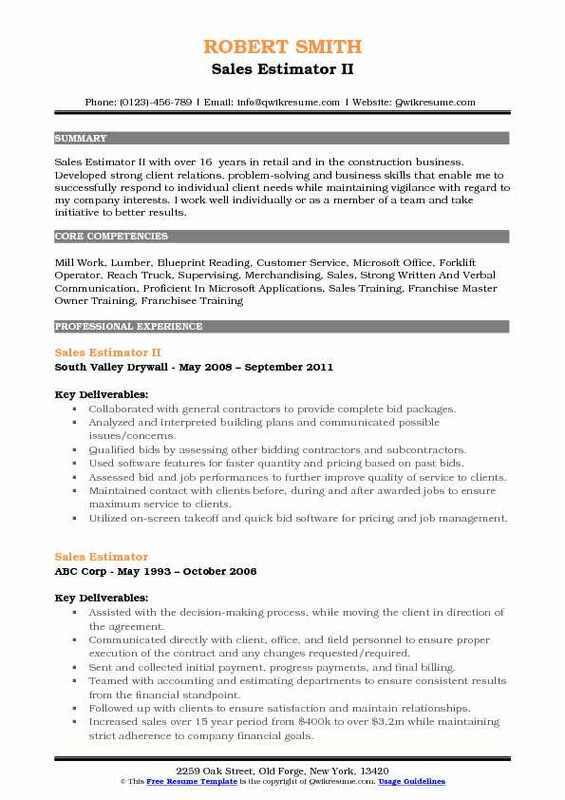 Summary : Sales Estimator II with over 16 years in retail and in the construction business. Developed strong client relations, problem-solving and business skills that enable me to successfully respond to individual client needs while maintaining vigilance with regard to my company interests. I work well individually or as a member of a team and take initiative to better results. Collaborated with general contractors to provide complete bid packages. Analyzed and interpreted building plans and communicated possible issues/concerns. Qualified bids by assessing other bidding contractors and subcontractors. Used software features for faster quantity and pricing based on past bids. Assessed bid and job performances to further improve quality of service to clients. Maintained contact with clients before, during and after awarded jobs to ensure maximum service to clients. Utilized on-screen takeoff and quick bid software for pricing and job management. Upheld account requirements by following customer ar data and referring to sales associates, dispatch or accounting when appropriate or necessary. Responsible for direct contact with customers, field technicians, and service managers. 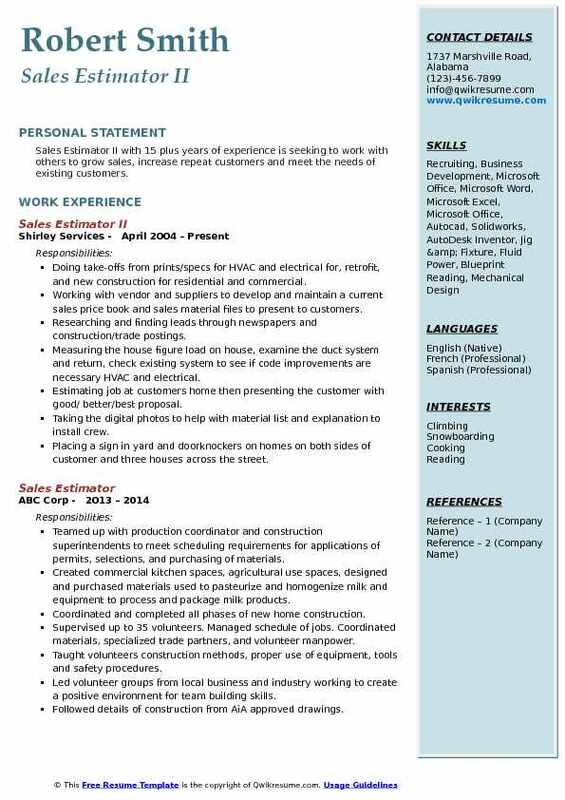 Summary : Sales/Estimator with 12 plus years of experience looking for a highly motivated company so that I can utilize my excellent communication skills and organizational skills and apply my talents and networking knowledge while finding ways to utilize my experience and skills toward becoming a valuable team member. Selling the custom cooler and freezer doors for Frank door, a cold storage door manufacturer. Interacting daily with end users, contractors, builders, refrigeration companies and box manufacturers. Managing each project from initial contact to delivery, educating customers on products and with choosing the best options for their application. Preparing pricing and freight estimates, sales orders and approval drawings for each project and preparing orders for production, scheduling, and shipping. Extensive experience handling a variety of different clientele through various levels of communication. Demonstrating the ability to read architects door schedules, door details, specifications and floor plans for bidding on new construction projects. Answering the customer's questions regarding products, prices, and availability. Collaborating with colleagues to exchange selling strategies and marketing information. Using the networking opportunities to create successful, on-going business relationships. 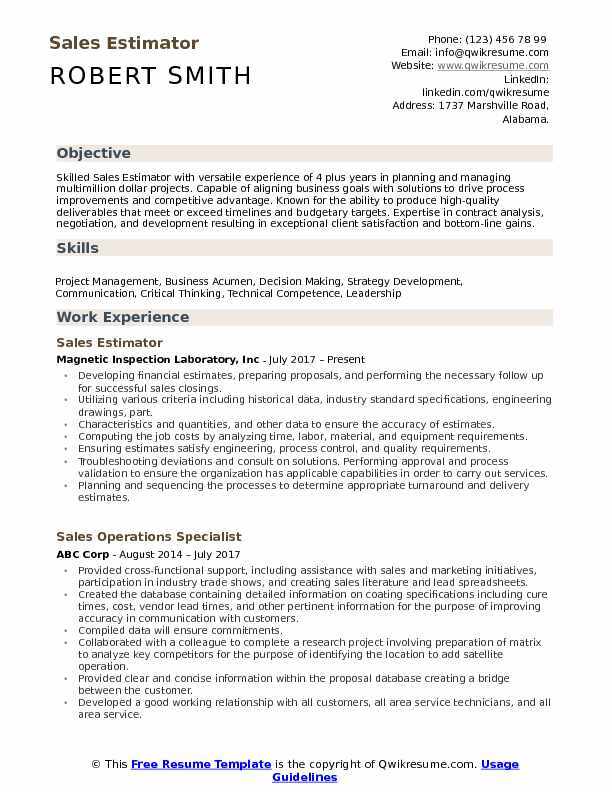 Objective : Ambitious Sales Estimator with 2 years of expeirnece dedicated to perfecting the craft. Results-oriented and highly driven to be a top producing employee. Always striving to be the best, and motivated to prove it. Always learning and improving on every aspect of the job. Very dependable and loyal. Processed quotes for windows and door products from C-17 contractors and window and door standalone dealers. Assisted clients with their questions on product line performances and applications. Created sales acknowledgments from quotes and collect deposit and balance and go over denotes and warranty. Followed up on orders with due dates for delivery or notify customers on delays. Assisted walk-ins or any inventory parts for service or sales and create sales acknowledgments for inventory/product control. Created and follow up on service requests and coordinate with production for correction. Covered and answered of overflow incoming calls and direct them to the proper person. Increased territory to one million dollar revenue level with 30% growth. Developed the lines of business through new customer acquisition and client upsell.